This week it was Matthew's birthday and this is the card that I created for him. At first I think "oh my" what will I create and then all of a sudden it all falls into place. I always find cards for men to be a bit more of a challenge. The pattern is a354 and is available from Ann's Paper Art webshop. Threads are Mettler Polysheen 1061 & 5934. 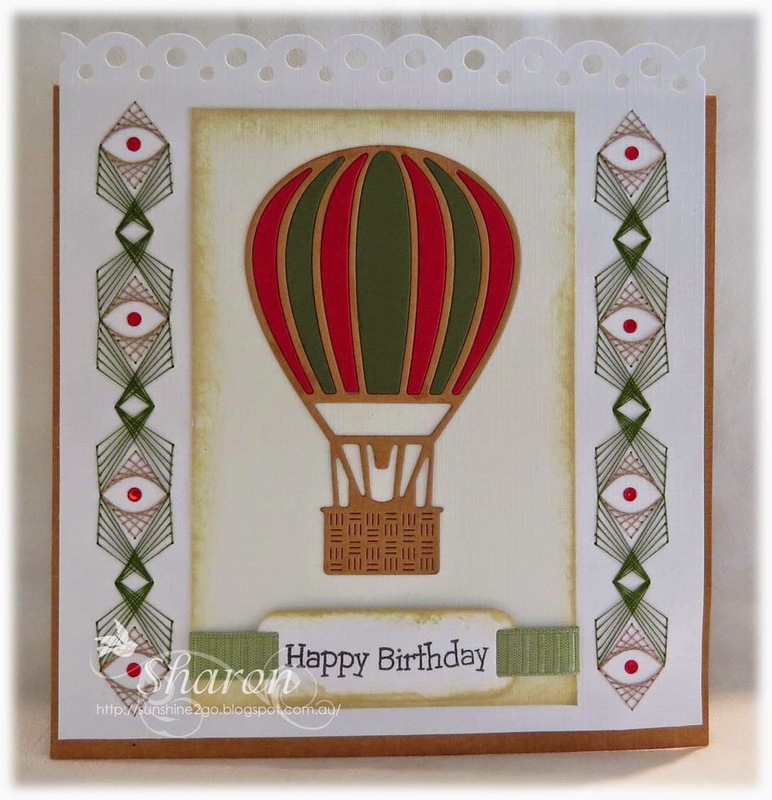 The Hot Air Balloon is by Cheery Lyn B360. 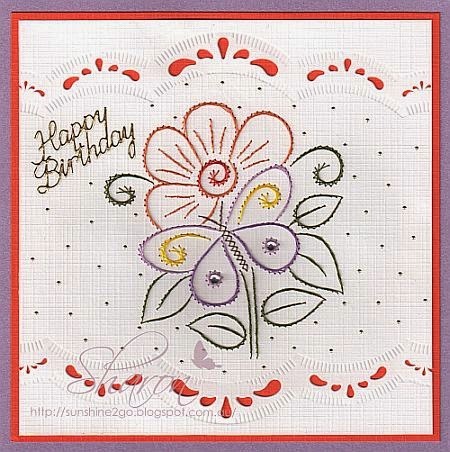 Happy Birthday by LOTV which I stamped onto Nellie Snellen mfd008. Ribbon, Hobbydots and Tim Holtz distress ink were also added. "Scallop double dot" although you could use Nellie Snellen mfd023 as it is very similar. Thank-you for coming by and having a look at my creation. 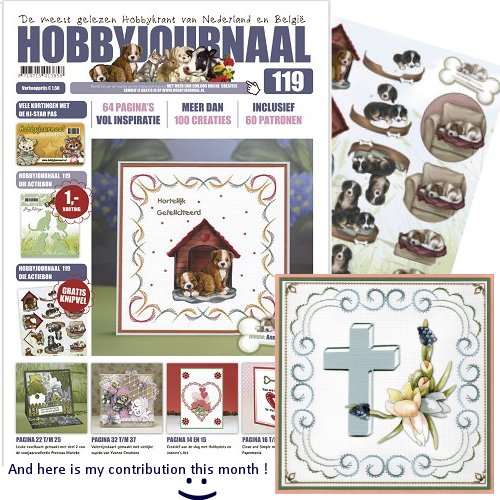 This month Ann is giving away a FREE PATTERN with Hobbyjournaal 119. The pattern is a204 which is one of Ann's older patterns that has been re-designed. I stitched the card above with Mettler Polysheen 0861, 0853,1061, 1220, 6133. 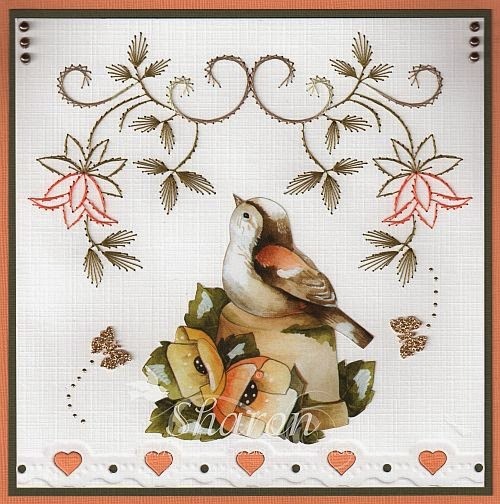 The beautiful decoupage is Precious Marieke HJ9901. I think that the Spellbinder E8-002 made a lovely edge along the bottom of the card. Ann also has a fabulous pattern in this months HJ & ships world wide. postal system, it has taken over 2 months to arrive. Once again I have stitched a690 combined with Nellie Snellen die SGD001. Which can be purchased as a set from Ann's Paper Art webshop. Threads are Mettler Polysheen 1141,1725,4332. 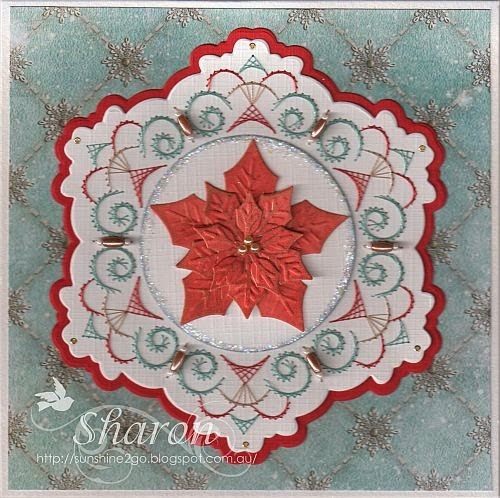 The poinsettia is Spellbinder S5-055 combined with Heartfelt Creations HCPC 3415. The background is from Joy! crafts "Winter Paper Bloc"
Thank-fully all of my cards have now arrived. This week Sue celebrated her birthday on the 9th of January. This is the special card that I created for her. The pattern is by Ann's Paper Art a718 I have stitched this beautiful pattern a few times and each time I do, I really do enjoy the end result. Threads are Mettler Polysheen 0605, 0945, 1114, 1335, 2910, 3045, 5934.
it comes with 7 different edges which you can mix and match. Hobbydots and "Happy Birthday"sticker have also been added . I created this card last month it had quite a way to travel. This month my friendship card was for Jackie. The pattern is from Hobbydol 63. Threads are Mettler Polysheen 0851, 3652, 3853. The beautiful dies are Marianne design LR0202 and LR0201. The butterfly die is Joy!6002/0390. I stamped onto Nellie Snellen mfd008. Tim Holtz "Weathered wood"distress ink. Hobbydots, ribbon, pearls and beads have been added. 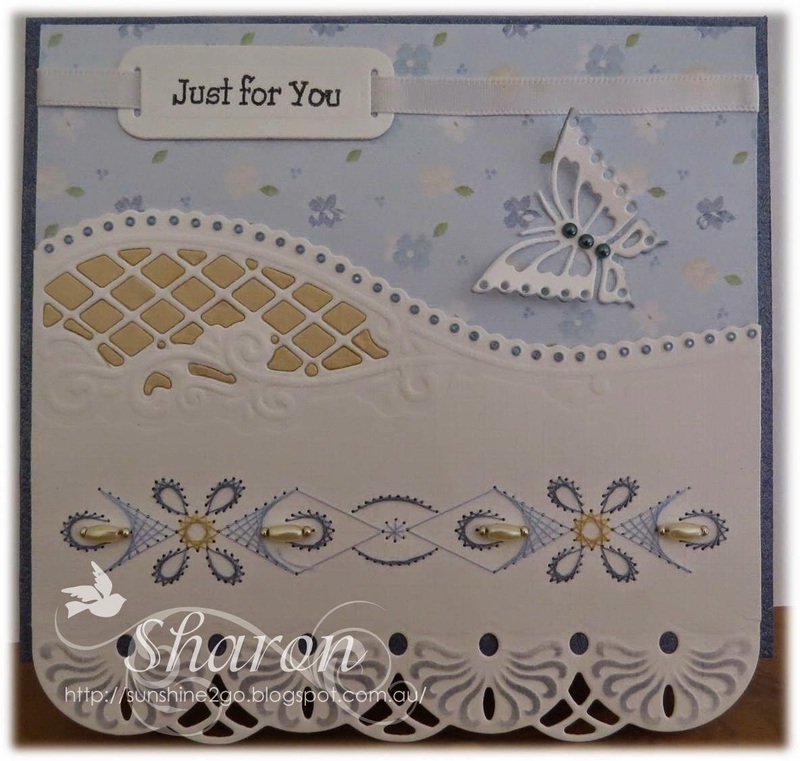 This is my first card for 2015 and I had a wonderful time creating it. I look forward to lot's of creativity during this year.